These foods are canned in glass jars for future use. This allows me to take advantage of large quantities of fresh, organic produce to make food we'll enjoy later. But another tool in my kit is the food dehydrator. The food dehydrator has quite a few advantages over preserving food by canning, and is sure to be in use at our house as the summer crops ripen. Dehydrating food means that low heat is used to remove most of the moisture from a food item. By evaporating most of the water, the food is much less likely to spoil over time, even stored at room temperature. As an added bonus, reducing the water content means you are also reducing the volume — and now the food takes up a lot less room to store. 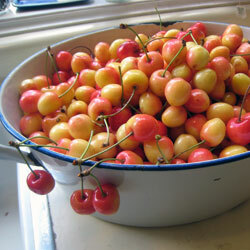 Earlier this summer, I pitted and dried about ten pounds of cherries from our neighbor's tree. Once dry, they fit into a single quart (4-cup) jar. That jar can be stored on a pantry shelf, rather than taking up valuable freezer space. A food dehydrator is an easy, low-cost investment. Canning with pressure or boiling water can be intimidating and time-consuming to a beginner. There are jars and lids to buy, recipes to check for safety, and a number of necessary pots and tools. With drying, all you really need is the dehydrator itself — and a knife. I like my Nesco-brand food dehydrator (about $45). But regardless of brand, look for a dehydrator that has an adjustable thermostat and stacking trays. If you have an oven that can run at a low temperature of about 140 degrees Fahrenheit, you can even do this in the oven with the door propped open. In my case, I run the food dryer on the covered front porch so I don't add more heat to the kitchen in the summer months. At first I was worried that this would attract insects, but that hasn't been a problem. The cherry harvest, before and after the food dehydrator. I love canning, but preserving fruit by that method often means adding large amounts of sugar. Drying fruits takes advantage of the fruit's natural sugars to make snacks that taste like candy without anything added. If you like dried fruit, give it a try. I dry large quantities of pears and Italian plums each autumn, and sweet cherries when I can get enough of them. The pears and prunes are eaten out-of-hand, and the cherries are delicious mixed in with my homemade maple-almond granola. Apples, apricots, peaches and other fruits dry well, too, if you have a cheap source to make it worth the effort. You can even make your own raisins — but be sure to use seedless grapes! I tried one year with our seeded green grapes; that was not a success. One of the top reasons I like making my own food is that I control the ingredients. I have total control about what I'm eating. Commercially-dried fruit often has sulfite preservatives; this is an allergen for some folks (such as my sister). With food you dry yourself, you can make it preservative-free, or treat fruits that tend to turn brown (such as pears) with ascorbic acid crystals to keep them more attractive. You can also choose to peel your fruits, or, as I prefer, leave the skins on for added texture and nutritive value. You can choose organic produce or local goods that haven't been coated in wax, picked unripe, or shipped across the continent (or globe). Among my favorite discoveries in recent years is how easy it is to make zucchini chips. Once you're sick of zucchini bread and zucchini brownies, and you've given away all the zucchini you can, and you've grilled more zucchini than you can enjoy — and the zucchini plants are still producing…after all that, try drying some zucchini. Sliced thin and sprinkled with a bit of salt or seasoning, then dried until crisp, these zucchini chips are great for snacking! Be prepared, though, for the aforementioned loss in volume. Three medium zucchini resulted in two cups of chips. It's a great way to get your vegetables in! 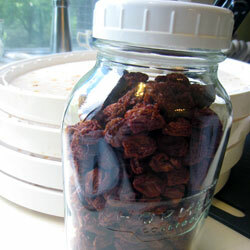 Food dehydrators can make it easy to create your own “sun-dried” tomatoes. One year, my holiday gifts were jars of dried cherry tomatoes immersed in olive oil. (These did need to be refrigerated, and I had added minced herbs to the jars.) Pretty much any vegetable can be dried for later use in soups or casseroles; think onions, green beans, celery, mushrooms, carrots… They'll re-hydrate as you cook. Again, this is practical if you have more food than you can use before it might spoil. Are you a jerky fan? For people who hunt or fish as a way to supplement their food budgets, drying meat in a dehydrator is a great option. You'll need a few more tools for this, and some spices and other ingredients, but game meats and fish are viable starting ingredients. You can also make fruit-leather with a dehydrator, but I've never tried this. You can also dry herbs. While fresh herbs are preferable, your own dried herbs are probably higher-quality than those available in the store. I've successfully dried oregano, rosemary, sage, lemon balm, bay leaves, raspberry leaves, and lavender from my garden. I try to do only enough to get me through one winter so it doesn't deteriorate with long-term storage. Herbs need to be dried at a lower temperature than other foods — around 105 degrees Fahrenheit. If your summer temperatures approach that, you can simply lay the herbs out between screens to dry them: No dehydrator required. The thinner you slice, the quicker the drying so it's helpful if all the food in a batch is of consistent thickness. That way, it's all done at the same time. A mandoline can come in handy. I like this inexpensive mandoline. When is it done? It depends. If you want something crisp, keep going ‘till it's dry enough to snap. With juicy items like plums, they should still be pliable, like leather. To test to see if fruit is dry enough, try tearing a piece in half. If no moisture beads along the edge of the tear, you're probably done. Most food dehydrators come with a booklet that gives recommended temperature and drying times. You can often start the dryer in one evening and it will be done the following morning. If you're worried that you might still have too much moisture in your first attempts, you can always store the dried food in the freezer. Store your dried foods, loosely packed, in jars or airtight plastic bags. If you pack it too tightly, you may get a moisture-pocket that encourages spoilage. Store in a dark, cool place if possible, to make it last as long as possible. Dry what you have! It doesn't make sense to go out and buy food in the store to dry (or preserve by any method, really), but if you grow your own food or have an inexpensive source for fresh food, consider drying a portion of it. If it doesn't work, don't sweat it. Try a small batch first if you're uncertain. I once tried drying several pounds of figs given to us by our neighbor, Tom. Everyone loves fig newtons, right? They were terrible, spiky things (apparently you need a certain variety of figs for drying) that I ended up putting out for the birds — who also rejected them! Cleaning the racks can be a tedious job. I suggest soaking them overnight either in a utility sink or the bathtub (they are too big for my kitchen sink) so the dried-on foods scrub off easily. Ironically, J.D. does not share my affection for dried foods. When he was a boy in the 1970s, his father manufactured food dryers. J.D. says that because of this, he ate more than his fair share of dehydrated food as a child. That's okay — more for me! There are 36 reader responses to "How to Use a Food Dehydrator to Preserve Your Harvest". 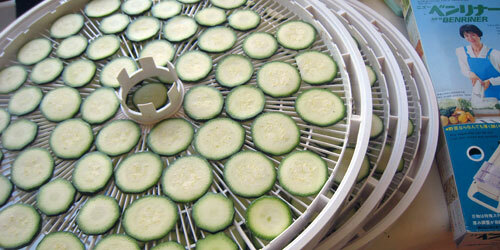 We’ve used a dehydrator successfully for fruits, but never for zucchini – we’ll have to give the chips a try! Our kids especially enjoy banana chips, which are super easy and much better than the store version. 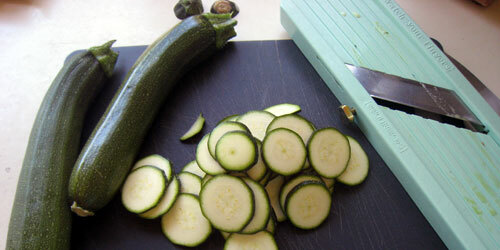 Abundant zucchini can also be pureed and frozen (no cooking or peeling necessary). Then the puree can be substituted for half of the oil in most recipes, adding nutrition and lowering the fat content. Amy and I have also been looking into buying a food dehydrator. Its mainly because I eat so much meat and we’re looking into ways of making jerky. I never thought of dehydrating zucchini!! What great tips. :) I wish I had thought about this before. For fruit leather, I have a few recommendations. Puree the fruit, or collect the juices and little bits that end up happening when you’re cutting certain fruits for drying. Mix it all together, and add honey for a bit of natural sweetener. When you put down plastic on the dehydrator rack, leave some to go up the sides, and pour slowly with someone else there to correct where the fruit puree is going. Spread evenly, and dry. If it gets too dry and hard, just let it sit out on the counter for a bit – the humidity will help soften it. Zucchini chips. What a great idea! Though we can eat an enormous amount of zucchini bread. I also like putting dried fruit in oatmeal in the mornings. Seeing photos of canned food always makes me weak in the knees. My family is REALLY good at canning yummy things, but I have not yet made the attempt and photos like these always make me long to go for it. SO happy to see a post from you again. Thanks for the dehydrating info & tips. I have always been wary of dehydrating, but you explained it very clearly and made it sound much better than I have been giving it credit for. I have a feeling that I’ll be using this article as a reference in the future… zucchini chips sound too good to avoid! Wow, those zucchini chips really do sound like a great treat!! I’ve never heard of doing that before! It can make sense to dry purchased items, if there is a good sale and/or they’re only in season for a short time. Can you dry berries? E.g. strawberries, blueberries. Dried cherries sell for about $5 a pound around here but we raise them here. They are great sprinkled on a green salad, in cherry chicken salad, or in a fruit salad. But to die for is cherry chocolate chip cookies. Add nuts and you have to bake two batches, because you ate the first one yourself. Add them to fruit pies, quick breads. For something quick add them to a brownie or cake mix. We usually buy them by the case. They also make them in yogurt and chocolate covered varieties for snacking. They are even better than m&ms. I always love posts from Kris. 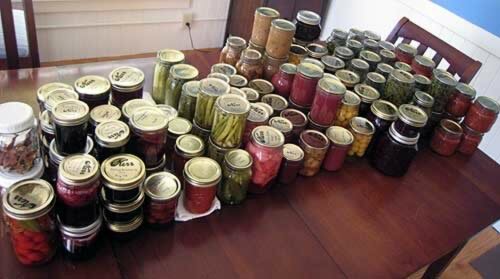 Plus, that first picture is what inspired me to ask my mother-in-law for help in home canning. Our back yard isn’t nearly as bountiful as yours but as things pick up, I’ll keep a food dehydrator in mind. Home-dried cherries sound absolutely delicious. Awesome post, Kris. A big favorite around here is dried apple slices, and they’re the easisest thing ever with an apple-corer-peeler doohickey to slice them. We dry…I don’t know, because I don’t use standard sized jars. 80 jars, mostly just over a pint? I do the same thing with summer squash that you do with zucchini – i’ll have to try it with the zukes. My other favorite, from fruit marked down for small bruises, is peach slices dipped in water with lemon or lime juice before they’re dried. It keeps the color and the little bit of sour is amazing. Very appetizing, Kris. :-) I was going to suggest lemon or lime juice as well (instead of ascorbic acid crystals); ascorbic acid is simply vitamin C which is of course plentiful in citrus juices. I’d think pear dipped in lime juice would dry up perfectly and taste delicious. This is one of those things I’ll keep in mind for the future when we are able to have a garden. 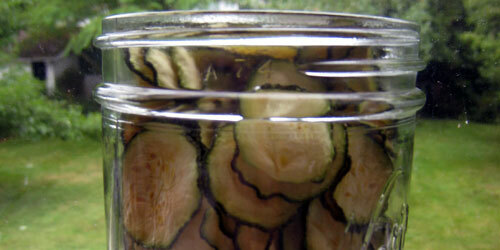 Would love to hear about your pickles next! Which dehydrator brand do you recommend? I am about to buy one. May I use your article in my blog at familyfoodies.com? Tomatoes, tomatoes, tomatoes—I love these dried. Great in pasta sauce! And much tastier than purchased sun-dried tomatoes, particularly if you grow your own. Other dried things–I don’t care for those so much. We used to have jars and jars of stuff like mushrooms and apples and etc and it just sat around and eventually grew mold until I threw it out. But canned veggies are wonderful. I particularly recommend canned brandied peaches–awesome over ice cream but watch out because they’re pretty alcoholic! I wish I knew how to can string beans properly, but I don’t because I’m terrified of botulism. Apparently non-acidic fruits and veggies have this as a huge danger & if you don’t do it right you can’t taste or see it but you can kill yourself by eating the improperly canned food. Scary! My mom knew how to do it right but she died years ago and I never learned. I am definitely going to try the Zucchini chips. I don’t know what it is with zucchini but it seems that no matter how little of it I plant, I end up getting enough to feed the neighborhood! I am really starting to try and grow as much of my own fruits and vegetables as I can. This post just gave me so many ideas about how to keep the food around and fresh long after the summer is over. Thanks! Karen, canning isn’t hard – just get a Ball book (a NEW one) and a pressure canner, and follow the directions to the letter. The issue I keep running into, though, is that there’s nowhere to get my pressure canner guage tested. This year I had to order a new one because the extension service here doesn’t do it. Kris, what a great post! I’m filing this away for when we retire, have our own place and garden. I love veggie chips, but as you say, most store bought have some type of preservative. I’ll try doing this in the oven til the time comes when we can get our own dehydrator. Also thanks for the link to the mandolin. I’ve been wanting one but most were quite expensive and seemed too fancy. This one looks like it would work well for us. Great post!! I’m wondering though, how much money those of us without green thumbs actually save in these areas. (yes ive tried, more than once. I have three green tomatoes this year. Ill try again next year too, LOL). I make homade barbecue sauce and tomato sauce because I like my recipes and I control the ingredients. I guess I really need to make a cost analysis to see if I actually save anything. I haven’t thought about drying food in awhile. Maybe I’ll ask for a food dryer for Christmas. I used to love eating dried bananas and apples that we made as a child. That would take me back and show the kids a way to make/eat a healthy snack. I found a Ronco (!!) dehydrator for $10 at a garage sale and will be pulling it out later this summer to dry tomatoes, apples, and some veggies. I wish I liked canned vegetables, even home canned ones – I just don’t. I might try brining and canning garlic because we grew so much of it this year. I canned tomatoes one year with a 25 lb box of seconds from the farmer’s market and that was a good use of time. Last year, I just froze them all in bags, and that’s worked out beautifully too. Great post, Kris! I’d never grown up with a yard or garden, and about ten years ago, we bought a house with plum and peach trees. I was floored by the bags and bags of Italian plums we harvested. Thoroughly intimidated by canning, I bought a Nesco dehydrator in desperation. The dried plums turned out to be amazingly tasty. Looks like another bumper crop this year, and I can’t wait! One tip — I bought a shower curtain liner to use as a waterproof, washable tablecloth. I drape it over a card table, set up in the kitchen, and I use this as my processing station for slicing and removing the pits. Makes sticky cleanup much easier. Inspiring and motivating! I need to start drying my bananas instead of throwing them away because no one ate all of them. Care to share your cherry tomato recipe with us? It sounds wonderful! Re : throwing out bananas. I used to do this but now when I get home from shopping, I take the peels off, slice them into 1″ slices and put 1-2 bananas in a zip lock sandwich bag to freeze. Then when I’m ready, I use them in smoothies. If there are 2 per bag, just pull out 1/2 of bag’s contents. This works great for me. You can dry plum tomato halves on very low power in the microwave, also. @Barb #19 – whether you save money depends on how much you spend on what you’re drying, and if you actually eat it instead of something else – we eat a lot of dried apples & squash chips as snacks, which means each pint or so is worth the $3 a box of crackers would have been. Having a small child means I always carry a snack, and dried fruit is great for that – it’s not messy, doesn’t spoil, and is calorie-dense. I have had tremendous good luck getting apples, apricots, small sour plums (for fruit leather and/or jam) and zucchini for absolutely free, or just the labor of picking. They are things people commonly grow here and either don’t eat at all or get very tired of before the season is over. The other thing the dehydrator is great for is small batches – so if bruised peaches are on sale for a few dollars a lug, or you have one or two strongly flavored fruits (like mangos, limes, or strawberries) about to go bad, it’s easy to make them into a tiny batch of dried fruit or stretch them with applesauce and make a regular sized batch of fruit leather. I have just started to can on my own – I used to do it with my mom in my teenage years. I am canning again because I came down with a sever food allergy and can’t have most foods bought in stores. Even 100 percent garlic powder causes me to react…. I have asked my husband for a dehydrator for my upcoming birthday. I hope he gets it for me. This post was great and has motivated me to try dehydrating foods so that I can control the ingredients. As the recipient of one of those jars of dried cherry tomatoes and rosemary in olive oil let me tell you they were great. I added the tomatoes to pasta I made for a meal for my friends and got a great deal of pleasure in telling them that Kris had made them. Thank you, Kris. I can’t wait until I have a backyard with a porch and garden again! Growing and preserving food is so satisfying. A food dryer is a great way to cut food costs for camping, especially backpacking. You can dry spaghetti sauce or applesauce and rehydrate them in plastic bags. For drying applesauce, my mother cut a sheet of plastic (one of those flexible cutting boards) slightly smaller than the dryer tray to spread the sauce on while still allowing air to circulate. Same thing for fruit leather, but we had to lightly oil the plastic first or the fruit would stick to it. One of the most expensive gourmet things that we did for free is drying wild mushrooms. It used to be an annual event for my family. 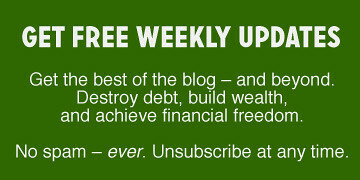 It’s super fun, free, and pays huge dividends. It’s really not that hard to stay away from the poison ones if you limit yourself to the sponge bottom and tree varieties which are easy to identify (vs the gill ones). I’ve been meaning to write an article about it. Must put it on my short list. Thanks for this post! I went to Amazon and got both the dehydrator — which I had been thinking of — as well as the mandolin. I love the mandolin! It does short work of slicing cucumbers for one of our favorite side dishes — cukes thinly sliced with water/vinegar/sugar mixture (2/3/3 ratio). This post is a great resource! We were gifted with an older dehydrator from my husbands parents when they were spring cleaning. I’m excited to use it on our garden products this year! Has anyone heard of oven canning for dry goods? I’m wondering if this can be used to better store the goods made in the dehydrator? can you dehydrate purple hull peas and then rehydrate to cook and eat them? Hi! Thanks for so many useful Tips. My first attempt at dehydrating “Bananas ” was a disaster!! Anyone know where to get those finer holed liners or what may be used as a substitute for a round Dehydrator if none came with it? Appreciate any suggestions.